Websites can be a costly investment. Don’t undermine that investment by letting the website go untouched and get stale. As with any star pupil or employee, if left untouched, its focus and luster may start to fade. At the very least, a yearly review should be performed. Between browser technology, design trends, SEO rankings, and consumer needs, some factor of your website is bound to need updating or reviewing. A website should ideally be reviewed and updated once a month. Your website can have all the tools and ability to shine, but without execution, it’s useless. Design trends change, SEO rankings fall, and consumer needs grow. Websites need updates to accommodate these changes. From technical tips to practical approaches, here’s a few key reasons to review your website in a timely manner. Your agency website could have dead links or missing images. It’s important to click around and check your website for errors that users could run into. If a consumer thinks you’ve dropped the ball on your own website, they’re bound to think you will drop the ball while handling their business as well. Make sure your first impression is a good one. Browsers update more than you might realize. The latest update might not be kind to your website. It’s easy to have a favorite browser. But, check different browsers on various devices to make sure your website is still loading and functioning properly. Some people land on a website with the intention of calling to speak with a real person. Make sure your contact information is always accessible and updated. Depending on your target demographic, this information could extend beyond your phone number, and require a link to your Google reviews or Facebook page. Don’t miss out on a potential lead by not thinking beyond your website. Consumers love to see what’s fresh and new. Whether there’s a service you’ve recently added or one you’ve stopped offering, make sure your website reflects this. You could be disappointing hopeful consumers or missing out on new business entirely if you forget this step. Search engines never sleep. Don’t get caught slacking with your website. Going too long without adding or updating content on your website will reflect poorly in search engine rankings. Reviewing your analytics and website data should be done at least once a month. You should then be able to use that data and research to know what areas of your website need attention. After investing in a website, it’s your job to manage it and unlock its potential. A little consistency and effort on your part can go a long way towards the success of your website. Not sure what to write about in your agency's next newsletter or blog post? 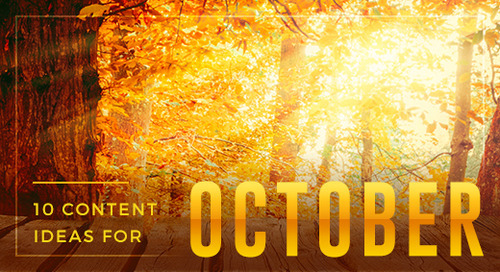 Try these October-themed topics.